It's that day again! 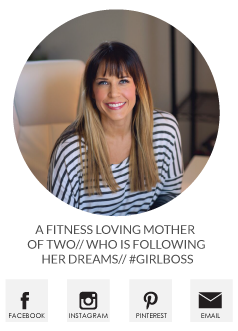 Check out Jessica Turner for more on Project Life. 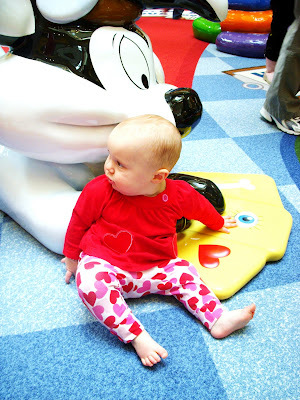 Sunday~ Playtime at the mall or it was until she found a milk carton under the bench and spilled it all over herself! Monday~ A little fresh air and sunshine at least until she decided the only thing she wanted to do was to crawl down the driveway and into the street. Do you see a pattern here? 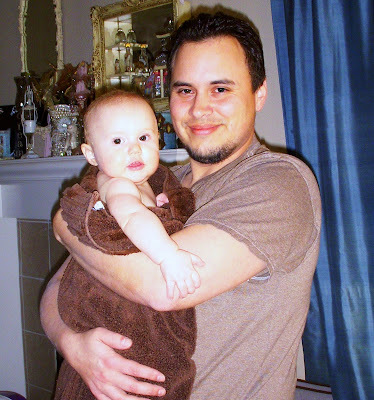 Monday ~ LOVES when Daddy comes home and rescues her from the bath I put her in so I could clean the bathroom! Wednesday~ Miss Kitty up on the counter and Miss Madi yelling at her. The poor cat just trying to get away from her! Friday~ My sister Katie. She loves to take self portraits with any free camera, but they ain't all pretty!! Your little girl is adorable! Love your pictures this week, my boys always loved to yell at the dog too. Why is that? Have a great week! Cool pictures! Your sister is funny! Great post! I LOVE the picture most of all of Madison in the background with Miss Kitty in the front. I LOVE THAT! Poor katie, now it's forever known how crazy she can screw up her face! Thanks for saying I'm a pretty Grandma, now you're my favorite child. 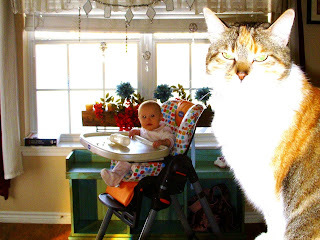 Love the one of your little one and the cat. So funny. Madison is getting so big!! 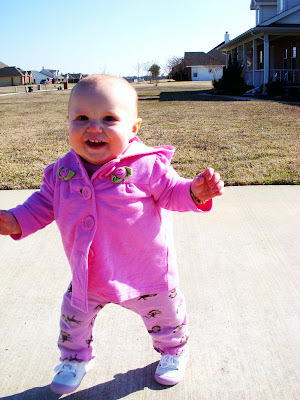 Look at her walking in her little pink outfit. I don't smell any roses.